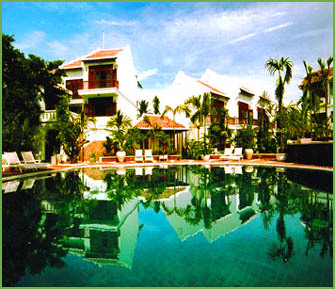 The Ancient House Resort-a three-star standard one, is situated only 1 km from the heart of Hoi An, by one side the main road of Cua Dai from the little town to the white sand beach with the same name as the road and by a branch of the big De Vong River the other side. Basing on Hoi An's long history and mix of cultures, the Ancient House Resort is built with special style of the town's ancient houses giving impression of a village with its very natural landscape, houses roofed by claytile and decorated by round and rectangular Chinese lanterns. A special care of the individual senses and feelings has been taken to provide to each guest a warm and restful environment. Situated on the first floor with the open view of the reception hall, gracefully decorated with well spaced and tastefully arranged tables and chairs as well as private rooms, Viet restaurant features individual buffet station and normal meal.If you want Hoian special foods,DaiChiem restaurant will serve you in style of Buffet ganh. Buffet ganh is a normal activities of selling local food in the flexible places.On the bar desk, a wide list of wines and coctails become easier to your choice and decission. Viet dinning is as unique and varied-as the architectural and decorative styles drawn upon to create this living vestige of the past. Its now good time for a real tourist.